Tomie dePaolo is this month’s Virtual Book Club for Kids author. The Knight and the Dragon is one of our favorites, but we hadn’t read many others of his books. He has quite a range of books, from non-fiction, to stories inspired by his family, to folktales to completely imaginative stories. The Knight and The Dragon is a captivating story about a knight and a dragon who (ineptly) learn how to battle each other…until they work out a better (peaceful) solution, suiting their skills. Any popcorn lover should check out Popcorn, which is full of popcorn facts and includes recipes. Bill and Pete is the first book in another series about Bill, a crocodile and Pete, bird (Bill’s best friend and toothbrush), as they rescue their fellow Nile creatures from the “Big Bad Guy” and his minions. (Sneak Preview of Monday’s post- we are doing a Bill and Pete to the Rescue activity). 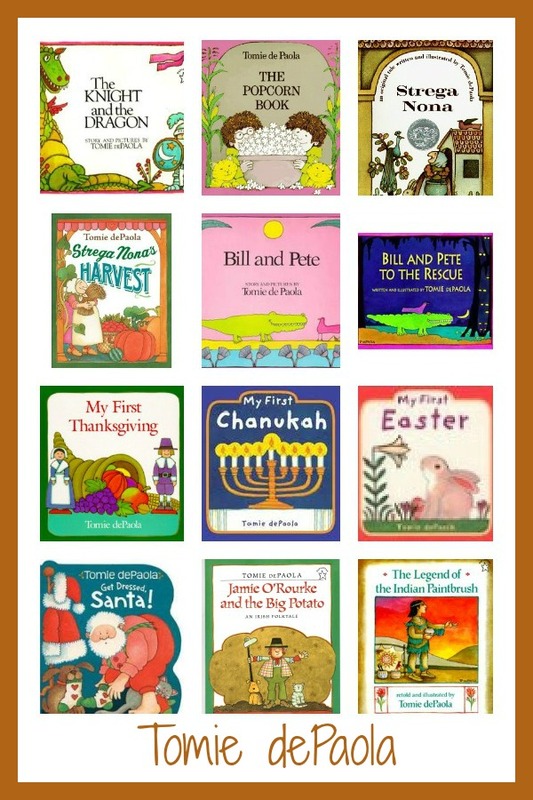 If you are looking for fun illustrations and a simple story to introduce holidays to children, dePaolo has board books for many holidays including My First Thanksgiving, My First Chanukah, and My First Easter. Get Dressed, Santa! is a fun book that kids will relate to- a last minute trip to the bathroom after getting all bundled up to go outside. dePaola also retells several classic folktales. Jamie O’Rourke and the Big Potato is dePaolo’s retelling of a classic Irish folktale, about “the laziest man in all of Ireland” and his encounter with a wish-granting leprechaun. The Legend of the Indian Paintbrush is his retelling of a Plains Indian legend.